YouTube is not just phenomenon anymore. It is here to stay and continues to become popular everyday. Where is the first place that someone searches for a house on the Internet. You’re correct. Google. Who owns YouTube? Google. Do you see where we’re going with this? If you’re not on YouTube yet with your real estate listings, you have not yet tapped into a free resource of billions of viewers. Many of these viewers are probably searching for a house to purchase or rent right in your area. The best free marketing is with video. What you don’t know yet is how to get videos done for cheap or for free to take your real estate business to levels you’ve never witnessed yet. You don’t need to be a Hollywood producer to make great videos. Anyone can make a slideshow with photos on a personal computer. What you are after is a video with moving images, music and a voiceover that will set your videos apart from the rest of what is out there. The more creative that you are in selecting your video package for real estate marketing, the more results that you can achieve. It’s not hard to get your videos made. Let’s get started. A couple of mouse clicks and a little bit of your time can get you an awesome video at Animoto. This easy to use website will let you create a video with your own photos that is up to 5 minutes in length for NO COST. If you want you can add their stock images, music tracks and limited special effects to any video that you create. One of the best parts, apart from the free price, is the fact that your video will be automatically converted to a YouTube compatible format. This will save you a lot of time during your upload process to YouTube. If you want a low cost subscription to Animoto, you can pay as little as $2.50 a month to get access to better transitions, effects, stock videos and images to use in your videos. Kizoa is another popular program that is absolutely free to use. The online program makes turning your photos inside slideshows very fast. You can add text, animations or just make simple collages to show your listings. A cool thing this service has to offer is expanded sharing. You can share the slideshows or collages that you make on Facebook, Twitter or other social media website with an easy link. If you want your own offline version, a free video conversion is possible through the service that gives you a DVD quality copy. You can use this to make DVDs, upload to YouTube, Vimeo, Daily Motion or other popular video sharing websites. If you just can’t get the hang of making your own videos, you can pay someone just $5 to make one for you. Fiverr makes it easy to get a video of 1 to 10 minutes custom made for you. Create your Fiverr account, find someone using the search system and you’ll have your video made in less than 2 days. You can even negotiate a different arrangement with a person that you like on Fiverr. He or she might give package deals if you have a lot of videos to create. It’s only $5. Now go out and make some videos to market your listings for free. You can thank us for the increase in your sales later. 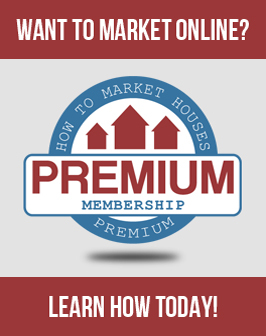 For premium training, be sure to take a look at our webinar that will take you from complete beginner to real estate marketing expert in just a short amount of time. You get to work with our professional staff one-on-one to make you a master at marketing your properties online.